This Tuesday we had a visit from Ambit magazine at the University of Winchester. Ambit is an erudite and lively quarterly magazine that features poetry, prose and art and champions work from writers old and new. 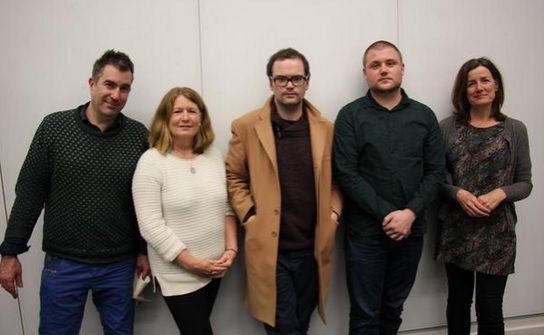 Editor Briony Bax was joined by Poet and Poetry Editor Declan Ryan and Fiction Editor Gary Budden. Declan, a Faber new poet, shared work from his new yellow pamphlet, ranging in themes from whales to boxer Joe Louis, in ‘Ethiopia Shall Stretch Forth Her Hands (The Seven Commandments of Joe Louis)’. Gary, founder of Influx Press then read a flash fiction set in Hackney about a charismatic nicotine stained outsider and an extract from Tonttukirkko, a story inspired by the enclosed photograph of a Finnish shrine. Briony, Declan and Gary then took questions from the audience, and talked about the submitting dos and don’ts. They recommended keeping cover letters simple and factual. They stressed the importance of reading and sticking to the submission guidelines, highlighting not to submit simultaneously to different publications. They also emphasised they do not take work that has been previously published and warned not to put creative works on your blog for free because this work could not be published anywhere else. The public event was concluded by an open mic session from some of the MA Creative and Critical Writers and Writing for Children writers. Why not get your own copy of the latest Ambit? And if you like it, treat yourself to a subscription to such a wonderful and colourful Literary Magazine. This entry was posted in Winchester Reading Series 2015 and tagged Ambit, Ambit magazine, Briony Bax, University of Winchester by Kath Whiting. Bookmark the permalink.